It’s estimated that 16 million Americans have a skin condition known as rosacea. But the vast majority of those people don’t know they have it. They think they’re simply prone to blush, or that their skin is overly sensitive. At the Center for Dermatology and Laser Surgery, we know that’s not the case. Since April is “Rosacea Awareness Month,” here’s some information on this skin condition and how we treat it. Dr. Bernard Gasch, who specializes in innovative medical and cosmetic skin treatments at the Center for Dermatology and Laser Surgery, has firsthand knowledge of rosacea because he has it. “Rosacea is a condition that affects patients both physically and emotionally and can greatly impact a patient’s confidence,” he explains. 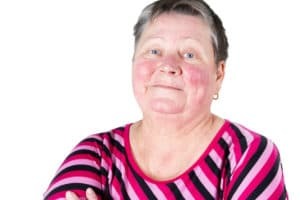 Rosacea causes facial redness and flushing, but it can also lead to the formation of small bumps resembling pimples, a burning sensation on the face, swelling, and other issues. Rosacea typically begins with flushing or redness in the face. This can extend down to the neck, chest, and back. Tiny blood vessels may be visible, particularly in the center of the face and these can extend outward as the condition worsens. Oral antibiotics— Tetracycline, amoxicillin, and doxycycline can reduce pimples and inflammation. Topical creams— Creams such as metronidazole and azelaic acid control rosacea. Other medication— Topical steroids can reduce inflammation but can be used on a short-term basis only. Skin cleansers— While patients should not scrub their face excessively, over-the-counter and prescription cleansers can relieve symptoms. Photodynamic therapy— In this therapy, a liquid is first applied to the skin and is then activated by a special light. Photodynamic therapy can reduce inflammation and improve skin texture. Laser treatment— Laser treatments target blood vessels on a person’s chest, neck, and face and have proven effective. Chemical peels— For some patients, chemical peels control rosacea. If you think you may have rosacea, don’t hesitate to call the experienced team at Center for Dermatology and Laser Surgery, (503) 297-3440, and let us help you. Are you unknowingly affected by this common condition? Chances are you may not know you have rosacea. Dr. Bernard Gasch, who specializes in innovative medical and cosmetic skin treatments at the Center for Dermatology and Laser Surgery, suffers from rosacea himself. He wants to shed a little light on this frustrating but extremely common skin condition. Dr. Gasch explains that “rosacea is a condition that affects patients both physically and emotionally and can greatly impact a patient’s confidence.” Rosacea causes facial redness and flushing but can also lead to the formation of small bumps resembling pimples, a burning sensation on the face, swelling, and other issues. Do you think you could have rosacea? Call us at the Center for Dermatology and Laser Surgery, 503-2907-3440, and let’s see how we can help. Some people think they often are lightly sunburned. Others think they blush easily. Others wonder if they had one too many drinks that night. Most don’t wonder if they have rosacea, but they should. It is estimated that 14 million Americans have rosacea, but most don’t know. Rosacea is a common skin disorder that usually affects the skin on the face. It shows itself in redness on the nose, chin, cheeks, and forehead. It starts as simple redness, as if blushing, but if left alone rosacea can develop into a more ruddy redness. While usually on the face, rosacea can also appear on the chest, back, or neck. It can even affect the eyes, making them appear bloodshot and watery. 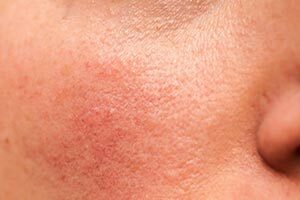 Rosacea can lead to solid red bumps and pus-filled pimples. Rosacea remains somewhat of a mystery, its exact cause unknown. One line of thinking holds that rosacea is a disorder of the blood vessels. Other theories involve microscopic skin mites, fungus, psychological factors, and a malfunction of the connective tissue under the skin. Flushing — This is often the earliest sign of the disorder, where the person frequently blushes or flushes. Persistent redness — This may resemble a sunburn or blush that doesn’t pass. Visible blood vessels — Small blood vessels may become visible on the skin. Bumps and pimples — This can resemble acne, as small red bumps or pus-filled pimples form. There are never blackheads, though. Eye irritation — Called ocular rosacea, this involves bloodshot, watery eyes. Styes can also result. Dry appearance — The central facial skin may appear dry, but is actually just very rough. Plaques — These are raised red patches, similar to what is found in psoriasis, but the surrounding skin is unaffected. Burning or stinging — The face may constantly feel tight or burning/stinging sensations can develop. Skin thickening — This usually occurs on the nose and is called rhinophyma, where the skin enlarges due to the production of excess tissue. While there is no specific test for rosacea, the team at the Center for Dermatology and Laser Surgery is well versed in the disorder. Treatments are individual, but include medications, both oral and topical, to bring the condition under control. Procedures can be performed to remove visible blood vessels and lessen reddening. There are also a series of triggers that should be avoided. When in our offices discussing your condition, we will walk you through things that can trigger your rosacea. Do you think you may have rosacea? Call us at the Center for Dermatology and Laser Surgery, 503-297-3440, and let’s have a look. Dr. Bernard Gasch, who specializes in innovative medical and cosmetic skin treatments at the Center for Dermatology and Laser Surgery in Portland, Oregon, announces that April 1 marks the beginning of Rosacea Awareness Month. 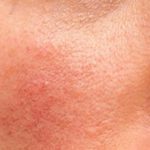 Dr. Gasch, who suffers from rosacea himself, takes a moment to draw attention to this extremely common and frustrating condition. 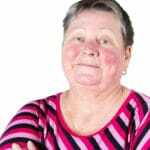 “Rosacea is a condition that affects many patients both physically and emotionally. Beyond the hallmark symptoms of facial redness and swelling, rosacea can hinder a patient’s confidence and self-esteem.” Dr. Gasch went on to cite additional symptoms, including small bumps resembling pimples as well as a burning sensation on the face, among others. Interested in Learning More About Treating Rosacea? For more information about rosacea, or any dermatology service we provide, contact the Center for Dermatology and Laser Surgery to schedule an appointment with any of our providers. We have two offices conveniently located at St. Vincent Hospital in Portland as well as in Hillsboro, and we can be reached at 503-297-3440.